By William Preucil, piano acc. Linda Perry. This edition: Revised Edition. Suzuki Violin School. Examples / Accompaniment CD. Published by Alfred Music (28262). Composed by Dr. Shinichi Suzuki, performed by William Preucil, piano accompaniment performed by Linda Perry. This edition: Revised. 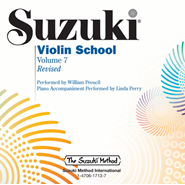 CD; Method/Instruction; Suzuki Violin School. Published by Alfred Music (39269). Piano accompaniment book for Suzuki Violin School Volume 1 - Beginner Composed by Dr. Shinichi Suzuki. This edition: Revised. Method/Instruction; SmartMusic; String - Violin (Suzuki); Suzuki. Suzuki Violin School. Book. 28 pages. Published by Alfred Music.